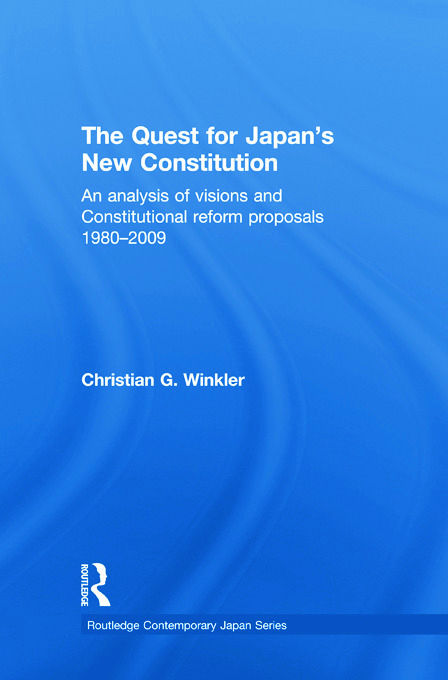 This book examines the many attempts over the last three decades to revise Japan’s constitution. As the book shows, these attempts at revision have been relatively conservative, aiming to embed in the constitution visions of a different future for Japan. Specific reforms advocated include: enabling Japan to have a more proactive foreign policy, more independent of the US-Japan alliance; strengthening the role of the Emperor, and excluding female succession to the throne; and emphasising more citizens’ duties, rather than their rights, in order to strengthen community and societal cohesion. By far the most comprehensive analysis of constitutional reform debate in Japan to be published to date, it offers translations and analysis of more than two dozen amendment proposals. The book provides a comprehensive analysis of the details of the reform proposals, charts the so far unsuccessful attempts to bring about the reforms, discusses the different groups arguing for reform, and assesses the nature of the proposed reforms. It categorises different versions of the vision for Japan’s future and shows that only a few campaigners are advocating anything like a return to Japan’s pre-war constitution. Christian G. Winkler is currently Visiting Researcher in the Faculty of Policy Studies, Chuo University, Japan.